"Cappuccino with cognac?" the Eritrean waiter asked. This question will be a shock to your system if you've come, as I did, from neighboring Sudan, where drinking alcohol can get you as much as 40 lashes. Only 25 minutes away from Sudan and the Sharia (Islamic Law), you can experience the full excitement of Africa, yet have all the comforts and flavors of Europe. 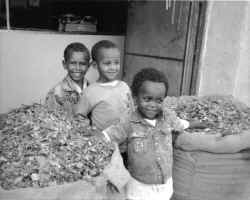 Compared to the disorganized atmosphere of Sudan, Eritrea will give you back a sense of familiarity. It's a country where nothing requires a bribe, and prices are fixed for everyone, even the foreigners. Eritrea is located in the Horn of Africa on the west coast of the Red Sea and is roughly the size of Mississippi, with a coastline of 1,000 kilometers. It borders Sudan to the north, Ethiopia to the south and Djibouti at the extreme southeast tip. The name Eritrea was given by the Italians and comes from the Greek word for "red." It is also a new member of the community of nations. In April, following a United Nations-monitored referendum, Eritrea 's voters overwhelmingly declared their desire to become a sovereign nation, free from Ethiopia. The country was under complete Italian control from 1890 to 1941. This explains why Asmara, the capital of Eritrea , is called Little Rome and reflects the flavor of the Italian Renaissance. It is perched on a plateau 2,300 meters above sea level and experiences a cool and healthy climate year-round. The sidewalks are tiled and lined with well-manicured palm trees, open piazzas and outdoor cafes where you can sip cappuccino with cognac, eat pastry and brush up on your Italian with old Ethiopian and Italian men. The bars are open until the wee hours and offer Saturday night dancing. The general street life has a carnival-like atmosphere that increases in tempo as the evening progresses. Germa Asmorom, executive producer at the only TV station in Asmara, said this about the city's excitement before the vote: "Just wait until after the referendum this year; it will be like Rio De Janeiro." The celebration continues. However, not everyone shares Asmorom's enthusiasm for the carefree behavior of the Eritreans. "I would not bring my family into this kind of environment. They drink all day . . . to forget the past," said Abduhla Ibrihim, a Sudanese embassy official in Asmara. "Forget what? Forget 600 years?" Asmarom snapped. "This is part of our heritage!" Remarkably, Asmara was untouched by Eritrea's 30-year war (it ended in 1991) and has the look and feel of an oasis, surrounded by the sands of conflict. The reason for the celebrations has to do with the homecoming of a large number of Eritreans who have been refugees in Sudan, the Middle East, Europe and America for up to 30 years. These are the people who gave financial support to the revolution and the families left behind. My hotel, the Lul Leghesse in central Asmara, is filled with Americanized Eritreans, speaking broken English with a variety of regional American accents. Their teenage children parade through the hotel lobby displaying the trendiest American fashions, while the parents are overwhelmed by meeting family members and childhood friends they haven't seen in years. Neghisti Seqoar, an office worker from San Francisco , has come back to Eritrea after 15 years in exile to take part in the referendum. We meet in the hotel bar for a cappuccino. Neghisti walks over and greets me, pushing her right shoulder into mine and then repeating the same movement with her left shoulder. It's the Eritrean national greeting. "I am so happy that we have our country back! I feel so invigorated! I gave up my job and put everything in storage. I may be here for three to seven months, but who knows?" she said. "Most likely I will go back to America. The Americans have been good to me." Asmara is host to visitors from many other Arab countries. The wealthy Sudanese choose Asmara for their honeymoons. The Persian Gulf Arabs escape to Asmara for the nightlife and freedom that's unavailable to them in their Islamic homeland. But outside this sophisticated metropolitan hub is still the old Africa, untouched by the modern world. A few kilometers past the modern walls of Asmara are typical Eritrean villages, with scattered round huts made out of straw and mud. Nearby, Christian and Muslim villagers work the fields together with age-old tools planting wheat, lentils, linseed, peas and beans. The nomadic caravaners on camels, called "ships of the desert," move silently past the villages. 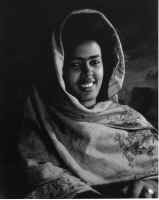 Eritrea is made up of nine major ethnic groups: Afar, Bilen, Hadareb Kunama, Nara , Reshaida, Saho, Tigre, and Tigrinya, each with its own traditional culture and language. Religion is divided equally between the nomadic Muslims in the lowlands and the Orthodox Christians who split from mainstream Christianity in the sixth century A.D. and are related to Coptic Christianity. A small percentage are animists, believing in the existence of spirits and demons. The Afar tribe enjoy an interesting reputation for collecting human testicles as trophies. 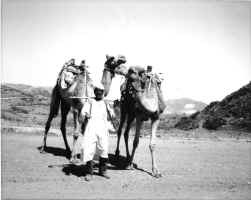 They are traders who wander freely with their camels between Eritrea and Djibouti. Yet these different groups with a wide variety of backgrounds have struggled together as Eritreans against a series of colonial oppressors: the Italians, the British, and the Ethiopians. Two hours from the festivities of Asmara is Massawa, the main port of entry on the Red Sea coast. In its last year of war, Massawa became the most savage battlefield, as Soviet-made Ethiopian fighter-bombers dropped napalm and cluster bombs on civilians. Massawa was captured by Eritrea, and the ghostly shells of houses and churches stand as a memory and symbol of Eritrea's liberation. And for foreign visitors, Massawa is a window that will give them a glimpse of the war and the suffering it has produced. The Eritreans are celebrating the end of the longest ongoing war in modern history. They are celebrating Eritrean independence and the homecoming of their displaced family members. How long the celebration will last, or what happens after that, is anyone's guess. Now is an opportune time to visit Eritrea and join the swirling carnival of laughter and merriment. As I approach the Asmara airport for my flight back to Khartoum, Sudan, I have the urge for one more cappuccino with cognac. Worse yet, I want to go back to my hotel and fill my water bottle with it. But visions of 40 lashes in the public market, plus the threat of having my passport marked as an undesirable, stopped me. With the best intentions, I faced customs at the Khartoum airport. The customs official dressed in her Islamic hijab (long, loose, flowing clothing, with the head and hands covered) jolted me back to reality. "Are you carrying any beer, wine or cognac?" she growled at me. "Of course not," I snapped back at her. "I don't drink!" *Visas are required of American citizens visiting Eritrea. Call the Department of State in Washington, D.C. , at 202-647-5225 for up-to-date travel information. The Embassy of Eritrea in Khartoum is located in Khartoum 2, near the UNISEF office, and grants visas in 24 hours. You need to bring a letter of introduction from the American Embassy (phone 74611 or 74700), 200 Sudanese pounds, and two passport photos. *Several airlines - Sudan Airways, Ethiopian Airlines, and Lufthansa - fly into Eritrea from Cairo, the hub for all travel in the Middle East. The best deal as far as money goes is Sudan Airways. Be forewarned that it is referred to as Insha'alla Airways. It means the plane leaves when Allah wishes it. Delays of many hours are not unusual. *The Eritrean Tour service is located on Liberty Avenue No. 61, in Asmara (phone 11-99-99), and will arrange tours, accommodations, and car rentals. *Some of the world's natural wonders are close to Eritrea, including the Danakil Alps and Africa's Great Rift Valley. And for the adventurous, there is a bus that leaves from Asmara for Kassala at the Sudanese border. The trip takes three days and two nights through mountains and desert roads that are unpaved.